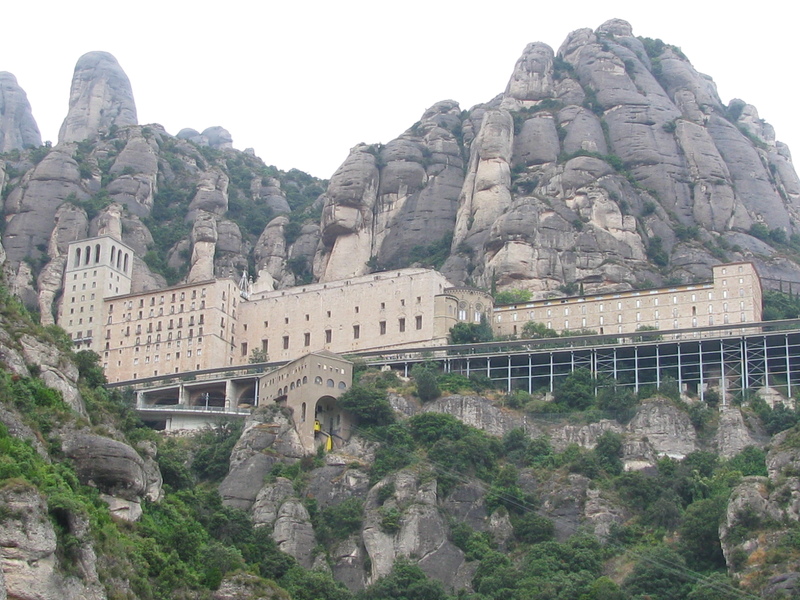 A view of the Benedictine monk mountain retreat in Montserrat, Spain. You can reach it by train and it’s about one hour from Barcelona. This entry was posted in Europe, Travel, Travel Photos and tagged Barcelona, Benedictine Monk Mountain Retreat, Benedictine Monks, Europe, Montserrat, Photography, Spain, Travel Blog, Travel Journal, Travel Photo. Bookmark the permalink. I like the way that the structure is built into the rocky landscape. It is pretty cool how it looks nestled in there. Any idea when this was built? It looks quite modern. I don’t remember the exact date. I think that the construction started a long time ago, but they kept adding to it so I am not sure of the timeline. Spain is a great place to visit. We had a blast and I’m hoping to see more of it. I still haven’t been to Madrid. I hope you go! I’m glad you liked the photo. Damn, i was just in Barcelona, I wish i had known about this place! Can you visit the monastery? It looks like it’s going to fall off the cliffs! That is a shame you didn’t see it. Yes you can go in and explore. They have some artwork on exhibit. There is a cafeteria as well. Also, we didn’t hear it, but I’ve heard the choir is amazing. The hiking around there offers great views as well. If you go again, maybe you can fit it into your schedule. Wow, this is really cool! What unusual rock formations. When I first saw it I was amazed…very creative. Those monks know how to live, don’t they? Imagine if they wanted BK delivered? Well there is a cafeteria so I bet every once in a while they crave BK. They must have the greatest view over there! So cool. The view is amazing. For the first half of our day there it was raining so we missed out on some of the views during our hike around the place. We went there a couple of years ago, took the funicular to get to the top and back. Lovely place! It is a lovely place…and the funicular was fun! I have always wanted to visit Spain. I did a partial Eastern Europe tour last year (Berlin, Prague, Venice), perhaps I can visit this side of Europe soon. I hope you can. You’d love it! I’ve been there! I was lucky enough to chaperone a school trip to Spain and France. Our choir sang here at Easter Sunday mass. It was incredibly beautiful. Thanks for sharing this great view – I don’t think I was able to see the place like this when approaching from the road through the tour bus windows! That is pretty cool that you sang there…what a great experience! The train drops you off near it and then you have to ride the funicular to the top. It is a lot of fun! The drive up is amazing! I was here 4 years ago..I want to go back! It is so beautiful there! And yes, I would love to go back! simply breathtaking. the stone looks weird. Thanks. I thought the rock formation looked a bit odd myself, but lovely. I would love to stay there for a few day and hike and soak in the atmosphere!